We go through these phases where older generations love to blame us for everything, and it drives me crazy. It reminds me of someone who comes in and absolutely wrecks your home, then whines, complains and yells at you for not cleaning up their mess fast enough. Seriously, if it rains tomorrow it will be our fault. All those participation trophies that they handed out, our fault. Bad breakfast? Our fault. Bee sting? Our fault. The newest thing that we millenials are being blamed for is the death of products and industries that were apparently meant to last forever. Apparently, our spending choices (just ours, not everyone's) are robbing the world of the glory of such gems as cereal, crappy shopping malls, and Applebees. Now not to get all millenialish on you (where is my avocado toast? ), but I am not going to weep if some of this stuff kicks the bucket. Chains like Applebees put bland, high fat non-local food out there, and they chase out local businesses as they do it. If we as a generation choose to eat at locally-owned restaurants instead, good on us. If we eat out less because we need to pay our student loans, that seems good too. Same for cereal- mostly it isn't that nutritious, and they create a lot of waste with those plastic bags inside the box. If we have discovered lots of other, better breakfasts, good on us. But there is one thing supposedly on the millenial chopping block that I need to take a stand for. That I think we could all actually benefit from keeping in the mix. Now, according to the study a slew of millenial bar soap articles is based on, millenials find bar soap to be kind of gross and less convenient. Maybe we all have memories of someone else's hair attached to a bar of soap. Yep, that's icky. I am not going to try to say it isn't. But you know what is way worse than an icky hair or the endless effort of lathering? We can feel annoyed that previous generations are wrong about us, but on this one we are absolutely wrong, and it's worth looking in to. In fact, I don't care what generation you are, bar soap is worth saving. I am pretty sure that in a few years, we are going to see plastics the same way we see asbestos or a random needle plopped outside our front door. Worse than gross or annoying- truly threatening and unpleasant. Liquid soap and body wash all come in plastic tubs and bottles, some with the push lid. Most cannot be returned to the company for re-use (though not all). Many of us don't have recycling (though you may be surprised- check terracycle). So our preference for liquid soap is just another one of the invisible sources of our plastic addiction. Even if you buy large bulk liquid soap (which you should if you really can't say good bye), you will still create enough plastic trash from your soap to fill your bathroom from floor to ceiling. Something to reflect on while you stand in the shower. By 2050 (when we are all middle aged and complaining about the next generation), our oceans will have more plastic in it than fish. Things won't be safe to eat and chemicals will constantly be leeching into our water and food supply. Our whole world will be bogged down in garbage. If we can be the generation that rids the world of Applebees, we can certainly take a stand and turn the tides on this massive problem too. For future terrible generations. Or even just so we can enjoy our lives. So bar soap can help save the world. No joke. It's got the power. You can find so many brands and companies that make their soap with paper packaging or no packaging at all. They also sell tons of soap dishes at secondhand stores, because Baby Boomers apparently don't want them. This shift from disposable plastic to plastic-free is huge, and we have to be making it in every area of our lives. This jump just happens to be easy and awesome. So just by switching to bar soap, we can eliminate one source of plastic from our lives. Easily. With barely any effort. We made the leap last year, and I honestly don't think it feels like a sacrifice at all. 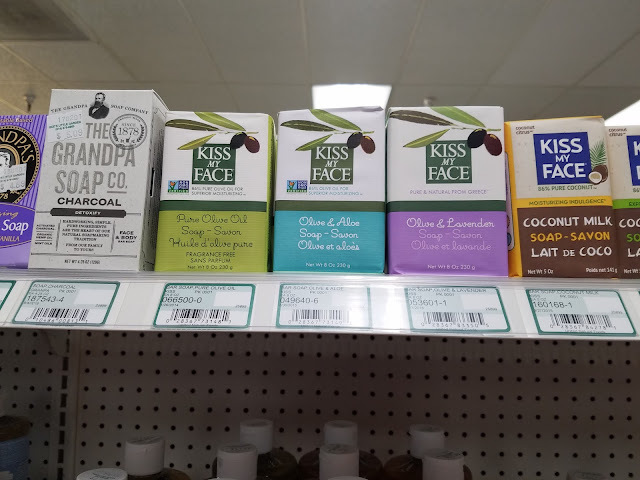 We use Kiss my Face olive oil soap, which smells great and my skin is the best it has ever felt in adulthood. Let me tell you some other great things about my soap. 14 4 oz bars (56 oz) of dove bar soap is less than 14 dollars. That's less than a dollar a bar (or less than a quarter an ounce). Same brand bodywash is 8.70 for 34 oz (slightly more than 25 cents an ounce). This might seem like a negligible difference, but bar soap also wastes less soap per use, because you get to choose exactly how much you want. We tend to use more body wash than we need. Maybe it won't be enough to pay off college loans, but it will add up over time. Like I said, we switched last year. We are still on our second bar of soap after all this time. Saving money for sure. For a product that is supposedly dying from millenial neglect, bar soap certainly seems to have a lot of great options. Even Dove bar soap, which may seem outdated, still won as one of the best soaps (competing with liquid soaps) last year. Plus, bar soap actually seems to have an up and coming coolness again (or for the first time? ), if you believe those crazy kids at Vogue. More beloved soaps you might want to try? 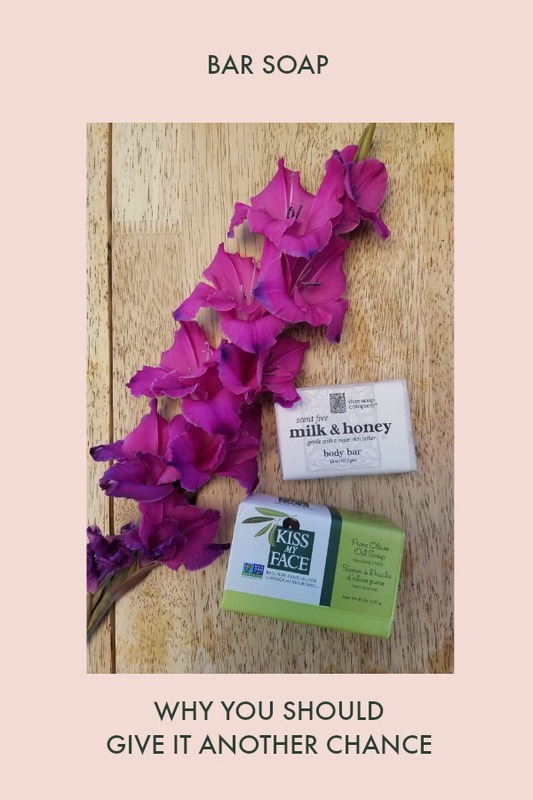 There are great options for face and body soap- Dr. Bronner's, Burt's Bee's, Cetaphil, Badger Organic Bar Soap, L'Occitane Shea Butter Extra Gentle Soap, Paul Mitchell Body Bar, Aveda Rosemary Bath Bar, LUSH soaps, and The Greater Goods. This is just the tip of the soapberg. I have even seen soaps at fair trade stores that are the product of all sorts of positive missions. Bar soaps are doing big things, and smelling all kinds of good while they are at it. Then, there's Etsy. When you put bar soap into Etsy, you get 100,000 options. My favorite would be Herbivore Botanicals and RockyTopSoapShop, but you have so much to choose from. I still hear you about the hairs. But the funny thing about being an adult is that you get to pick what's normal. And hairs need not be normal. Lather on a washcloth and you won't even feel like you are rubbing the same bar on you as someone else. You can do this. 4. Did I Mention You Eliminate One Plastic From Your Life? This is huge, because it means you have won a huge victory against waste before you even get starter. It basically guarantees that every time you lather up, you do some good (and save the world from your stink). You can buy great brands of bar soap in paper packaging or no packaging at all. So this step has huge impact. If you can't find bars in your local grocery store or pharmacy, be sure to check smaller local stores before you throw in the towel and shop online (where it inevitably will get shipped in plastic, because life). Most plastics (including most soap bottles) have BPA and other chemicals in them. These have proven to leech into things AND mess with your hormones. So that is what you are wiping all over your skin and into your bloodstream. So getting more plastic out of your life, also keeps trash out of landfills and unnecessary chemicals out of your body. Using bar soap just makes life that little bit better. Don't let it go the way of cereal. So, my dear millenials, bar soap isn't behind us. It is right in front of us. With a little bit of courage, we can break away from our liquid soap brethren. Want more shopping inspiration? 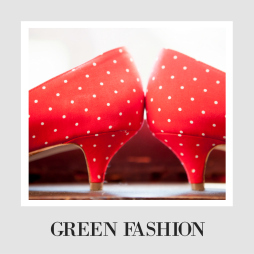 I have TONS of ideas of how to make your shopping greener, cutting out waste, and finding the local gems near you! 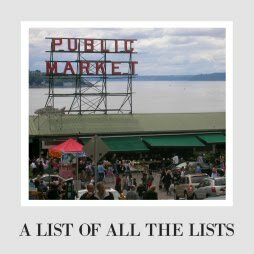 Check out the Giant List of Lists for more great stuff! This is eye-opening. I had never thought of this and will see if I can convince my husband to go back to bar soap. This is very interesting, I would never stop to think that soap made such a difference. Thank you. I LOVE this article! I'm going to share it to the hills. I made my switch back to bar soap within the past year and I love that I am no longer contributing to the plastic pollution. I love your tip about using a washcloth. Thanks for such a great post! I prefer bar soaps than the liquid ones. Maybe it's because it's more common to use bar soaps here in our country. Reading this post makes me glad that a simple decision of not using liquid soaps could actually help reduce plastic pollution. I love Bar soaps, rather I switch between liquid and bar soaps very frequently. My kid loves applying bar soaps more on his body as for him it is a sort of game. Always have been a bar soap user! haha but I never thought that a bar soap would have such a positive effect on the environment. Wow! Great post! This is very interesting... I've actually gone through phases of using shampoo bars instead of liquid, so I have to say, the hair on the bar wouldn't really be an issue for me, haha! Bar soaps have come a long way. They used to be way to dry for me but I recently went back to them because they do last so much longer.